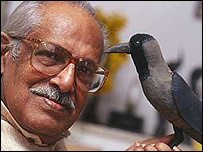 Leading Indian film-maker Hrishikesh Mukherjee has died in hospital in the western Indian city of Mumbai (Bombay). The 84-year-old director, known for his simple stories about Indian middle class people and their relationships, had been ill for some time. The award-winning film-maker was best known for popular films like Anand, Chupke Chupke and Abhiman. In 2001, Mukherjee was awarded India's biggest film honour, the Dada Saheb Phalke award. Working in a film industry that has been often panned by critics as one churning out escapist, candy floss entertainment with stories set in foreign locales and actors togged out in outlandish costumes and dancing to Western tunes, Mukherjee was possibly the last of the truly rooted Bollywood directors. "He was a great director, he was like an elder brother to me. His films were essentially Indian in nature," said legendary singer Lata Mangeshkar. Actor Rajesh Khanna said the director was a "great man who made great films". Hrishikesh Mukherjee began his career in the late 1940s as a film editor in the rundown studios of the eastern city of Calcutta, then home to a flourishing regional film industry. He eventually moved to Mumbai, where he was an assistant director to legendary filmmaker Bimal Roy on his film Do Bigha Zamin (Two acres of land) in 1953. During a prolific career which spanned four decades, he directed almost 50 films and also wrote a number of his own films. Mukherjee will possibly be most remembered for his 1970 film Anand. Mukherjee made some of his most meaningful and popular cinema in the 1970s - Guddi, a sardonic insight into the film industry, and Chupke Chupke, a rip-roaring comedy about a professor and his brother-in-law. In the 1973 film Abhiman, a film which explored professional jealously between husband wife, he paired Bachchan with the star's wife, Jaya Bachchan. He directed his last film Jhooth Bole Kauwa Kaate in 1998, returning to the studios after nearly a decade.